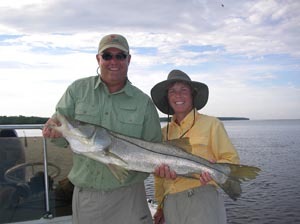 Chokoloskee Charters is your total guide service for Everglades National Park. This is a very rich fishery that provides many different opportunities and habitats to fish. Recognizing this, the best guides, each with their own specialty have been brought together to provide a level of service and experience unmatched in the area. For a single angler or a corporate group, we have the right boats and the right guides for you to get the best experience from your trip to this wonderful place. We offer experience and diversity. With guides specializing in technical fly fishing, kayak fishing, live bait fishing, light tackle spin/plug fishing, sight fishing the shallows or fishing families, given enough notice, we will match you with an experienced specialty guide. Most importantly, all our guides are good with people. An enjoyable experience is our mission. Each guide has a unique specialty and preference, but all are diverse enough to make a multi-boat corporate trip a success. All our guides are experienced captains and fishermen and will guide you on your fishing adventure into the Park. The three primary guides have over 85 years combined experience in this fishery. We offer many different types of trips using Flats Boats, Center Consoles and even Fishing Kayaks. You can fish the extreme shallow flats, the back country, the 10,000 Islands, the beaches and even the offshore wrecks and structure. The trips range from a single day trip to a complete packages including lodging, meals and variety of specialty trips. It is important to book early. However, if we are booked, we will make all the arrangements for you or your entire group with the "better" guides in the area ... be it a single boat for you or a dozen boats for your company. All bookings are subject to our standard booking and cancellation policy . A Visa/MC is required to confirm your reservation. All trips are subject to availability. Some trips are only available seasonally. Please do not hesitate to call us with any questions that you may have. Tight lines! All charters include bait, tackle, gear, iced coolers, licenses, insurance and safety equipment. Gratuity for your guide is solely your discretion based on your satisfaction. If local conditions dictate, we may advise a charter that is less than a full day to take best advantage of the conditions. Split Day Charters are offered during the spring, summer and fall months (daylight savings time) for the best action. Some of the best fishing for big fish is during the warmer months. However, the action is usually best in the early mornings and evenings. The air is cooler and water temperature is lower so the fish are much more active. We leave early many times before sunrise to fish for tarpon, snook and redfish fish. When the bites is over, will return back to the dock for lunch, showers and a well-deserved nap in the air-conditioning. In the late afternoon/evening,, we blast off again to fish through twilight. Many anglers want to target tarpon or permit in their afternoon trip. Others choose to bring the family in the evening so all can enjoy. These are long days, but we are fishing the most productive times, and we have a well-deserved rest in between. Kayak Fishing Trips Chokoloskee Charters is proud to provide Guided Kayak Fishing in Everglades National Park and the 10,000 Islands. We are one of the most experienced outfitters and services of in the industry offering not only traditional, shore launched paddle fishing trips, but trips very deep into the Park utilizing the kayak transport boat, the Yak Attack. 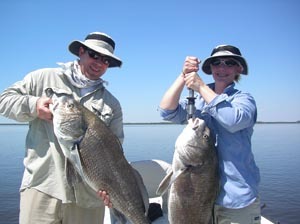 Everglades Kayak Fishing -- "Catch the Experience"
Chokoloskee Charters and Capt. 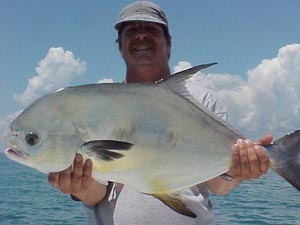 Charles Wright are known for putting our anglers on permit. On a typical trip we will hookup 4-8 fish in the 15 to 25 pound range. The fishing is fast paced, strenuous and exciting. If you have never experienced it, you should. For some it can be a life-changing event! Fishing artificial and natural structure for kingfish; gag, red and goliath grouper; mackerel; snappers; cobia and triple tail. If fishing with live bait for permit a $50 surcharge will apply to purchase bait crabs. The offshore trips are in the 26' foot Morgan Center Console ... see below. The packages include all accommodations for two anglers for three nights and two half days of fishing. Stay at the comfortable Kayak Shack cabin. A marina, store, deli, liquor store and a bar and restaurant are on the property within very easy walking distance. Arrive for the first night's stay and then rise early for a hearty breakfast before a full day's snook or tarpon fishing. Your boat will be stocked with ice water, ice, bait, tackle, gear, iced coolers, licenses and safety equipment .. just bring your personal gear and whatever you wish to eat or drink. After returning to the docks, take a hot shower and then have your catch cooked by a local chef. The next morning, have breakfast, and if the weather allows and you are interested, change boats for a different style of fishing for the day. Finish your trip with another great dinner and a good nights sleep. Price includes all taxes, but excludes alcoholic beverages and food. Subject to availability April 1 thru Dec 15. 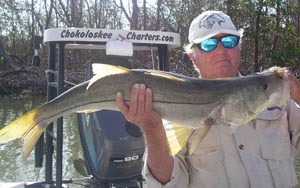 Chokoloskee Charters run many "special" trips throughout the year. This year we did two, four day, all-inclusive bonefish trips to the Lower Keys, a three day bone fish trip to South Biscayne Bay, day trips to the No Motor Zone above Lake Ingram and a four day houseboat trip, with skiffs in tow, to the Suwannee River. Additionally, overnight camping trips begin in November and continue until May. Similar trips are planned throughout the year, and announced on the website. If the schedule matches up please join us. If it does not, call and let's plan a trip that does! All bookings are subject to our standard cancellation policy.